Goodness, where does the time go? The last time I wrote on this blog about Dada Mail we were on v9.0.0 - now we're 6 versions past that. Much of what I do in this project is make complicated things easy to use. Here's a rundown of many of the security enhancements and abuse protection things just for the subscription process. It's not required that my users know what all this is, but everything here is enabled by default, and works without any needed bother. Not an easy task!, but makes me sleep a little better at night. Dada Mail v8.3 was recently released. Dada Mail itself is a mailing list manager written in Perl. It's a project I've been working on since 1999(!) - lots of blood/sweat/tears. It's somewhat of a mix between Mailman (or Majordomo, if you remember that app, which I initially went out to inadvertently replace! ), and one of the big email marketing services, like Constant Contact or MailChimp. Difference to those services, is that you run it on your own server/hosting account. The system requirements are minimal (really), so a cheap cPanel-based shared hosting on Bluehost or whatever will work just fine. It has support to hook up with Amazon SES for mail sending, giving you a very competitive platform to send mass mailings to your announcement list or discussion list at a really good price. If you want more performance, you can run it as a PSGI app - full support to run it under Plack/PSGI, or running as a FastCGI script without Plack (mod_fcgi? ), or as a plain CGI script, even. Dada Mail tries to be flexible. You won't need root access to install - it comes with its own web-based installer. Just upload the distro and a helper script, and away you go. One of the newer features of the app is called, Magic User Templates. This feature allows someone with very little experience with manipulating HTML code to integrate Dada Mail into their already existing site. It does this by basing it's own layout and design off of an already created page - say: the homepage to your own website. Magic User Templates fetch this via a URL, and then places its own content between a tag, it finds via a css selector that you specify. Pretty easy for the user, and solves the problem I've been having of people wanting to brand the app to match their site, but not wanting to dive into their site's HTML the HTML of the Dada Mail's templates, and then learning how the templating language Dada Mail works (HTML::Template, basically). That's a big barrier to entry, when you just want something branded. "Integration with Wordpress" is maybe my #1 feature request, but it's a nonsensical thing to me - what exactly does that mean? If it means: "I want Dada Mail to look like the rest of my site", then Magic Templates are the answer. To do all this manipulation, I've taken advantage of the excellent HTML::Tree CPAN distribution, which can read in the HTML pretty well, and give a tree-based interface to the HTML the page is made up of. Then you can fairly successfully output the HTML back. It does have some shortcomings, as it has a hard time with HTML5 tags. There's a bug opened up about it (which, I now can't track down - believe it has to do with HTML::Parser? ), but there's not been a lot of work to fix it, as the maintainer wants a correct fix, and not a hack. One solution is to use the HTML::TreeBuilder::LibXML module instead of HTML::TreeBuilder, but it comes with its own silent dragons - the docs are just so minimal, it's difficult to gauge what the heck it actually to does and what methods are now unsupported. I gather the lack of docs is in direct inverse to the brilliance of the module author, and that's a weakness of being just a regular ol' joe (like me). Regardless, that will be the future of where I go with this, but for now, HTML::Tree is working great. Here's the code I came up with. Hopefully the code is very straightforward, readable, and holds no tricks whatsoever. My coding is fairly straightforward for many reasons: I like no-nonsense stuff, and this is actively maintained code - it's a living project for the last 15 years! One demerit I'll give it though, is that it is a long, long sub. Someone much cleverer than I could take this down a bit. For the majority of the cases, that works well. You may notice that the code is also written very defensively. Since Dada Mail is released as an app you're supposed to simply upload and run (Basically), I can't promise that HTML::Tree and friends are going to be available, so this entire feature has to be optional, and not cause the entire app to break. Rather, I give directions on how to install the missing CPAN modules, so that a motivated user can do that part of everything themselves. I've also gotten into the habit of returning such defensive subs with 3 values: a status of if it worked, a hashref of errors to describe what didn't work, and the returned string, which is also set to undef if things didn't pan out right. With that, I can then fallback to something else, if the sub didn't return what I need. The idea is that something needs to work, since a template has to be returned to be used, and it's not acceptable to have something like this break, which would break the entire app. This is a great example of why: since we're relying on an outside resource (the URL to the webpage), that resource could be gone, or the details of it (the css selector in the HTML) could be changed, rendering our configuration outdated. What do you do? Throw an error and break the app, or return what the problem is, and try to describe would could be wrong, so that you can reapply the Magic Template in a more correct manner, later? For me, the correct answer is to do the latter. This is a consumer focused app, and people just want to get the job done, without having the app break in surprising ways. The big ta-do with v8 is that Dada Mail supports being run under FastCGI and Plack/PSGI, when before it was only able to run under CGI. That's a big level up. Thankfully, because of the Perl community, porting a project that began in 1999 and has been growing quite organically since then wasn't terribly impossible. For the rest of this post, I'll be going into some of approaches I used, to make this happen, with the minimal amount of work maximum amount of laziness, impatience and hubris. Fortunately or unfortunately, one of the constraints of adding support for Plack/PSGI is that CGI support still has to be kept: meaning you can throw up the app via FTP, run an install script, give it some parameters like database creds. and be off to the races. The vast majority of installs of Dada Mail are done on pretty simple, cPanel-based (also a Perl company) shared hosting accounts. Small business use Dada Mail to keep in contact with their customers. Churches and private groups (think doctors and lawyers that want to talk shop) run off of it. With Dada Mail's support for third party email services like Amazon SES, this is actually a pretty realistic situation. Shared host companies usually have pretty terrible shared host mail servers, especially if you're running a very big/busy list; Amazon SES (and friends) work much better. But, the venerable CGI::Application framework looks great! Since it already walks the line of easily supporting both CGI apps (which it was built to do!) and PSGI/Plack apps (which it has since been given support for!). The main difference with writing a CGI app for CGI::Application, is that you return a string for the body of your page in each method, and set parameters for any headers you would also like to send. CGI::App does the actual printing to (say) STDOUT for you. This small amount of encapsulation helps keep your app a bit tidier than without it, since you're not print()ing whilly-nilly everywhere. So, the first step, if you were to migrate to CGI::App, is to find all those print statements, and get rid of them, only returning the data you want to show. That's an easy step, but can take a little while to find every instance of this happening. CGI::App has the idea of run modes - run modes can be thought of each screen of your app. You probably have a default run mode. For Dada Mail there's a list page run mode, and admin login run mode, a send out a mass mailing run mode, etc. CGI::App does have CGI::App::Dispatch to help with mapping PATH_INFO information to various resources served up by your app. I wasn't keen on porting Dada Mail's dispatch-ish stuff to this - yet. It seemed like a great way to break current ways we're doing things, AND the current way of doing things is 15 years of messiness. Here, prepare_cgi_obj() just takes the CGI.pm object, reads the PATH_INFO and stuffs values into various parameters, much like CGI::APP::Dispatch, but without the need for me to rewrite everything - we just encapsulate it into its own method. When I'm ready, I could move over to CGI::App::Dispatch (or not! Thus the beauty of CGI::App). Dada Mail already comes with a web-based installer, which works great for installing Dada Mail as a CGI script, but would need a little more work to work under Plack/PSGI. It didn't seem really worth it to add support for that, so I instead gave Dada Mail's current installer support for being run via the command line, so you can install/configure Dada Mail for Plack/PSGI, right before you run the, plackup command, which is a much nicer workflow. Showing 281 changed files, with 38,717 additions and 31,998 deletions. Please give Dada Mail a spin, the next time you have the need to set up a mailing list. Dada Mail Seven Released! Rejoice! I've just shipped v7 of Dada Mail! 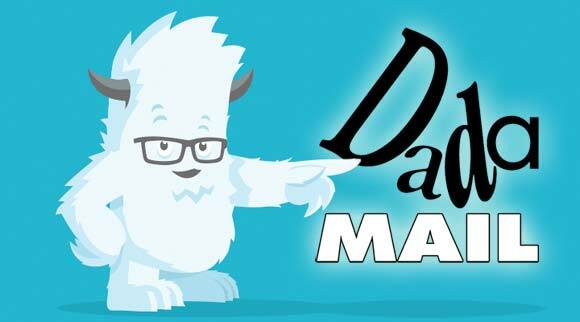 Dada Mail is a web-based mailing list manager, written in Perl. It's a project I started way back in 1999 - one of those, "started in my dorm room" types of projects. I'm currently catching my breath from the big push to finally Ship, but it feels good to get it all done. One of the more interesting (to me) aspects of this release was to finally ship a PDF manual. I write most of the docs in Plain Old Documentation (with a little HTML sprinkled in), which is then turned into HTML, which is then! then turned into a PDF book. I've been wrestling with how best to do with, but it turned out just using HTMLDoc directly was the best way to go about things. A little (minor) futzing with my POD/HTML to make the table of contents pretty is all I needed to do. I already and still have an HTML version of the manual online for people to utilize, but now people can download it and read it on their favorite device, which a lot of my users have been clamoring for. I think I surprised myself to know that the book surprised 300 pages by a wide margin! That's a lot of writing! It gives me a lot of confidence to write another book, since I can't tell myself, "Well, books are long! And there's no way you'll ever write that much!" . I can now tell myself, "Whoops! You somewhat mistakenly already have! DO IT AGAIN!" Over here at Dada Mail, we do a lot of verification of email addresses when confirming subscriptions. Is the form of the email correct? Has this address been used to try to subscribe with before? Has the user themselves confirmed their subscription? What happens when there's an error? There's a lot to it (sadly) and if something in one of these steps goes wrong, a subscription doesn't happen, or worse yet, a mailing list is tarnished with not-so-valid addresses. This little tale is about invalid in form addresses getting on people's mailing lists. A user posted on the Dada Mail support forums: "There's an address with a space in it, that's entered my list! It's causing problems with delivery of the ENTIRE list? How did that happen?" A lot of the time developing a very complicated piece of software is supporting it (I think, anyways). When a question like this comes down the tubes, I have no great answer, except it must have been an outside thing. So I ask, "Was the address added directly into the backend?" That's something that happens from time to time, although there are many pitfalls: importing data can be done incorrectly - and even if it's done correctly once, the design of the backend can change, and then it's not done correctly anymore. That's why, if it's an option, it's a good idea to use the API that presented to the developer, rather than try to retinker it, yourself. When the user replied back with, "Nope!" I knew I was really stuck. "But I have tests!" I protested to my Macbook Pro. "Coverage!" "I didn't roll my own email validator!" "I did everything you're supposed to do!" my $address = 'someone@example .com'; # notice the space! And, there's my problem, in a pretty simple case. This is the primary method which determines whether an email address is valid. It's behavior is modified by the values of mxcheck(), tldcheck(), local_rules(), fqdn(), and fudge(). If the address passes all checks, the (possibly modified) address is returned as a string. Otherwise, the undefined value is returned. In a list context, the method also returns an instance of the Mail::Address class representing the email address. my $address = 'some one@example.com'; # notice the space! my    $address  = 'someone@example .com'; # notice the space! This makes it difficult to patch up Email::Valid, since then I'd have to delve into Mail::Address - and perhaps Mail::Address has a perfectly good reason to do this. Since both Email::Valid and Mail::Address have been around for so long, and many programs have been written with their API the way it is, it's a pretty good bet they'll stay this way. my once unique list now isn't so unique anymore. my $address = 'someone@example. com'; # notice the space! Firstly, I couldn't believe it was a bug, since the way things have worked hadn't been changed in eons. Next: way back when I first wrote put this validation stuff in the app yarns ago, I was thinking that Email::Valid was nothing but a nice wrapper around a very, very complex regex created by Jeffrey Friedl back in the day for a book on Regular Expressions that he wrote. It looks a little like this. It's a doozy. So I actually knew about this problem before, and forgot - there's actually a link to a bug tracker in the actual test, which means I had handed off the problem to someone else to fix. Lazy! Read the docs! This very peculiarity is documented in Email::Valid's own docs. Don't assume! Just because you think everything's working, doesn't mean there aren't weird little edge cases - it's probably a given. Tests are good! Skipping tests that don't pass doesn't always help you. Reporting bugs in other modules is good! Trying to fix them? Probably better. My thanks to rjbs for being patient as I stumble around a module he has been nice enough to adopt, warts and all.